Kim setting out on Dec. presidential run? Kim Doo-kwan, governor of South Gyeongsang Province, has drawn keen attention in media and political circles with moves that many see aimed at positioning himself as a presidential candidate. Local newspapers reported Thursday that Kim was planning a series of book-launching ceremonies in Seoul and other cities, giving specific dates. The reports said the events will likely mark the start of the liberal-minded administrator’s quest for the presidency. 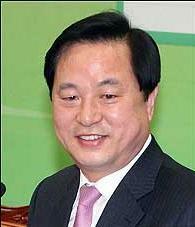 Kim, who served as home affairs minister under late liberal Roh Moo-hyun, has been considered a potential presidential candidate for the main opposition Democratic United Party. Kim, however, denied the reports. “I am currently working on a book, but haven’t scheduled any such events,” Kim told reporters. One of his aides explained that the idea must have been floated by a local autonomy institute where the governor served as the inaugural chair. Yet, speculation continued around the 52-year-old former minister that he may be preparing for a run in the presidential election in December. Last February, the institute, which is regarded as Kim’s think tank, opened an office in Seoul in a move seen aimed at supporting Kim’s possible presidential campaign. Later, Kim’s fan club moved to the same building. The same month, Kim, who in 2010 won the gubernatorial election as a maverick candidate in the conservative heartland of Gyeongsang, broke his promise to voters that he would remain independent during his four-year term and joined the DUP. After that, he started speaking out more often on domestic politics. The day after the April 11 general election, Kim criticized the DUP leadership, saying the outcome was the voters’ verdict on the opposition group for its failure to bring the corrupt and incompetent administration to judgment. Nicknamed “little Roh Moo-hyun” for his humble background, down-to-earth, upright character and unbending principles, Kim is considered by some DUP members a “wild card” against Park Geun-hye, the ruling Saenuri Party’s chief and strongest presidential candidate. Kim Jong-in, a senior member of Saenuri’s leadership council, has once said that Kim, out of a pack of potential liberal candidates, would make the strongest contender to Park. Other potential runners were Moon Jae-in, a close friend and chief of staff to Roh and two former DUP chiefs ― Sohn Hak-kyu and Chung Dong-young. The Saenuri leader said Kim may appeal beyond the traditional liberal base, with a likable personality and humble background. The governor started his public career as chief of a small village in Namhae in 1988 and served as head of Namhae County in 90s. In 2003, he became the youngest Cabinet member, handpicked by Roh as home affairs minister.